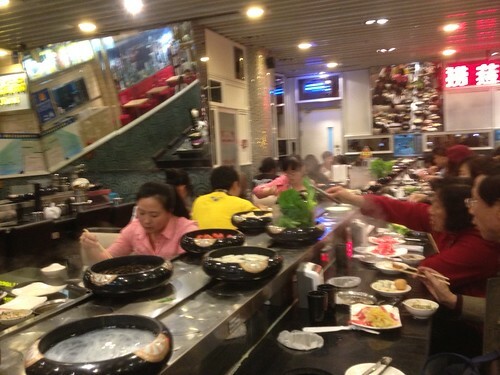 We all know of conveyor belt sushi but I was instantly intriqued when I learned about conveyor belt hotpot. So when a friend came visiting from Singapore, I dragged him there with me to try. So we went to this restaurant that I picked randomly off the internet. It was an all-you-can-eat-except-meat buffet i.e. meat dishes are to be ordered and charged separately, which I thought was fair for a business like this to be sustainable. So I order an order of beef while my friend took the lamb so that we can both share. The total bill that we have to pay up front was RMB 110.00 (SGD 22.00) for the two of us. We were then led to our seats and the waitress proceeded to take our order of what soup base we wanted and then we went off to get our dip sauces and drinks. So the meats served and the hotpot boiling, we are good to go. Everything from vegetables to meat balls to tofu to noodles are all chugging along as we pick them up with a pair of tongs given to every partron. Gary: In the capital of QQland.